Metal Work by Danielle Crissman currently on display at the Art Museum of Greater Lafayette. LAFAYETTE, Ind. 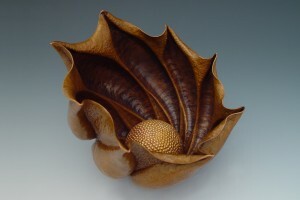 — The Art Museum of Greater Lafayette will host the “Making it in Crafts” national invitation art exhibit from May 20, 2011 through September 10, 2011. The exhibit features the art of approximately 30 invited craft artists who made a living creating and selling fine art crafts. Many of the most renowned craft artists from the Greater Lafayette area will be joined by top crafts-makers from throughout the Midwest. “Making it in Crafts” celebrates the imagination by showcasing splendid crafts from nationally renowned artisans. The works are creative and innovative in form and materials, including glass, metal, fiber, wood and clay. These objects were chosen because they delight the eye and satisfy the soul. We sought uncommon beauty and good design in common objects. All of the works will be for sale. The Art Museum of Greater Lafayette is open Tuesday through Saturday from 11:00a-4:00p. For additional information, contact Glenda McClatchey at 765-742-1128 or glenda@artlafayette.org.